The VocoPro Commander-USB-Headset is a USB two-channel digital UHF wireless headset microphone system offering easy operation and computer interfacing for vocals and speech in conferences, presentations, and houses of worship. It utilizes the 900 MHz band from 908.5 to 928 MHz to avoid interference from TV, radio, and Wi-Fi sources. 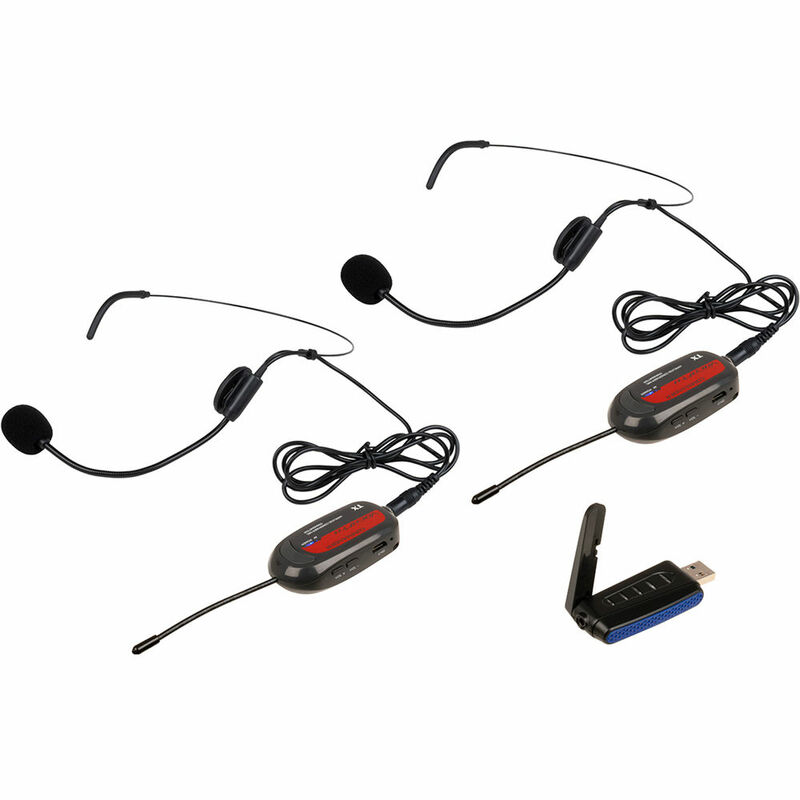 The system includes two headset microphones, two wireless bodypack transmitters with internal rechargeable batteries, and a USB wireless receiver with a flip-up antenna. The microphone transmitters operate in Group 3 (908.5 to 915 MHz) and Group 4 (921.5 to 928 MHz) to allow simultaneous use. The Commander-USB-Headset features simple one-button re-syncing for seamlessly changing frequencies if interference is encountered. LEDs on the receiver and transmitters clearly indicate power and signal status. Thanks to the receiver's built-in soundcard and compatibility with Windows computers, iOS/Android devices, televisions, and PS3/Wii gaming systems, the Commander-USB-Headset is ideal for recording or streaming with hassle-free setup. Connect the 3.5mm receiver output to headphones or a PA system for convenient monitoring without interrupting the USB feed.